Besides the sub-barrios of Once and Abasto, Balvanera is home to the most magnificent building we found in Buenos Aires, Palacio de Aguas Argentinas (The Palace of Running Waters). When we came upon the building we were awestruck by its beauty and asked a nearby lady what it was, she said, "solo agua", we were puzzled by her description, until we stepped inside. In 1877 the people in charge of the water supply realized a need to build a major domestic water distributor and collecting tank for the entire city. The site chosen was the block formed by Cordoba, Ayacucho, Riobamba and Viamonte streets. In 1879 the block was fenced in with masonry and iron grating where the storage tank would be built. Since this was an upscale neighborhood it was later decided that an attractive facade should be built around the large service storage facility in keeping with the other government and private buildings nearby. Construction started in 1887 and finished in 1894. It's a huge square with 90-meter sides, with corner volumes not matching the wall angles and large terraces leading to the majestic entrances in the center of each side. The style is best described as eclectic with a tilt toward French Renaissance. 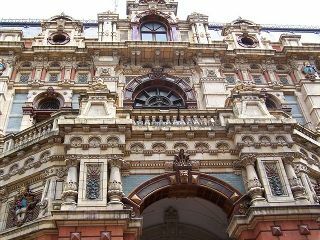 The facade is colorfully decorated with terra cotta and ceramic pieces supplied by Royal Doulton & Co. (London) and Burmantofts Company (Leeds) and 130,000 enameled bricks. Both factories produced special pieces displaying the shields of the fourteen Argentine Provinces, the Nation and the Capital. The water facilities have since been moved to more strategic locations. The tanks and distribution system remain as part of a museum. The Agustin Gonzales Library was the first library in the nation to specialize in sanitary engineering. To facilitate access to this documental heritage the library has added new and larger space and more modern facilities. The ground floor is dedicated to customer service and bill paying. So this architectural gem, dedicated to water and sanitation, was conceived primarily as a mere façade. 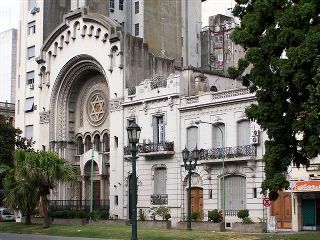 There are about 250,000 Jews in all of Argentina, 200,000 residing throughout the barrios of Buenos Aires. The Once neighborhood is rich in Jewish Orthodox culture with many synagogues, kosher restaurants, grocers, butchers, bakeries, pizza and ice-cream shops. The AMIA (Association Mutualista Israelita Argentina), Jewish Community Center, dedicated to health and human services, is located here. On July 18, 1994 terrorists bombed AMIA; 87 people were killed and hundreds were wounded. Today AMIA is alive and well servicing the community, albeit with barriers, security guards and police protection. There are many opportunities for worship and study in the 50 orthodox, 21 conservative, several reform synagogues and 70 educational institutions scattered across the city (security prevails). The Israelite Congregation of the Argentine Republic (CIRA) is the oldest institution of Judaism in the country. Founded in 1862 in Buenos Aires CIRA was responsible for creating important organizations such as AMIA, DAIA, the Superior Institute of Judaism Religious Studies, the Latin-American Rabbinical Seminary as well as other institutions of assistance and Jewish education. The congregation was able to build its own Synagogue in 1897 and since it was located on Calle Libertad it was called Libertad Temple. In 1932 it was rebuilt to its present structure. The high arched entrance is graced with the Star of David and the doorway is adorned with symbols of the twelve tribes of Israel. Inside a high dome, a single circular stained glass window rises above the striking Sacred Ark. The high stained glass windows around the balcony depict biblical episodes. Sometime ago Rabbi Marshall Meyer made a major impact in rejuvenating the spirit and energy of the congregation, which resulted in a dramatic increase in participation, particularly by younger members of the Jewish community. For the more traditionally minded, separate services are held in a chapel downstairs. Currently about 350 families belong to the congregation. In the year 2000 the Synagogue was declared a National Historic Monument. The Jewish Museum of Buenos Aires is adjacent to the Libertad Temple. Founded in 1967, its treasures include documents and items donated by the Jewish community of Buenos Aires. There's a fine collection of old Torah Scrolls, paintings by old Jewish masters, documents by Argentine and foreign artists, intellectuals and scientists. Most fascinating are documents of the Jewish colonies in Argentina, which were sponsored by Baron Maurice de Hirsch. Our thanks to the wonderful ladies who voluntarily guide visitors through the Museum and Synagogue and provide excellent insights into the history of the Jewish people in Argentina and Buenos Aires. Museo del Holocausto/Shoá is located at Montevideo 919. The mission of the Buenos Aires Shoah Museum is to keep alive the testimonial conscience of the existence of the planned murder of six million Jews during World War II at the hands of the Nazis. 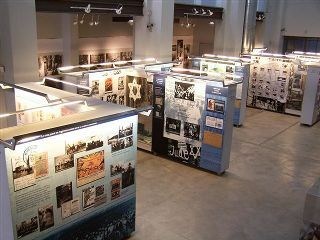 The goals of the Museum are: to raise consciousness about the dangers of racism and xenophobia; to avoid the resurgence of ideologies and facts leading to the perpetration of the Shoah; to educate in the respect of cultural diversity and towards the different; to honor the victims of the Shoah with the memory and the survivors with the continuity and transmission". The Buenos Aires Shoah Museum was declared as a Cultural Interest Site by the Buenos Aires City Congress in 2006. The exhibition is entitled "Images of the Shoah" with photographs, maps, documents, drawings and objects. "The main goal of the exhibit is to dignify, humanize and restore the victims deprived of their identity by their victimizers, through life stories with names, surnames, and specific faces. The public should be able to identify themselves with those personal stories." Twelve milestones are displayed on panels: Jewish life in Europe prior to war, beginning of Jewish life in Argentina, interwar period, rise of nazism to power, kristallnacht-the beginning of persecution, WWII, deportations, ghettos, extermination, final solution, resistance, survivors searching for home, never forget-never again, the Lipszyc-impact of the Shoah in the life of one family. Besides the historic Av. Corrientes, Av. Sante Fe and Av. Cordoba cut across the city. Both are major shopping and transportation routes (Line D of the subway runs under Sante Fe and collectivos (buses) of many numbers and colors scamper along both). "Porteños" love to shop, these Avenidas are wall-to-wall opportunity, busy on weekdays, jam packed on weekends. Libertador was the original upscale residential avenue. Its apartment buildings rise high with wonderful views of the Palermo green and the river. Here you can buy luxury automobiles, enjoy fine dining, relax on a comfortable patio with your coffee or helado (ice cream) and do some serious shopping. Speaking of shopping, the exchange rate of the peso vs. the US dollar offers exceptional value when buying products made in Argentina. Exceptional became incredible during our stay as seasonal merchandise was reduced for clearance. Imported merchandise sells for the same price as it does worldwide, (sometimes priced in US dollars), no value there. Prices in many stores are negotiable when paying cash. Many times the discount for cash was greater than the "tax free" scheme, refund of VAT on departure. It is best to pay in pesos because goods are priced in pesos. You will get a better exchange rate at the bank ATM than in a shop. Argentina is famous for its leather products both in quality and design (jackets are a huge favorite). We found the footwear particularly appealing. Botticelli, Av. Pte. Quintana 360, has been creating ladies and mens world class styling using Argentine leathers and quality production methods for 40 years. I wasn't even in the market for shoes but could not resist the pair I spotted in the window, outstanding style, soft leather, beautifully made and incredibly well priced. There are many, many shoe stores in all price ranges - go crazy! Uniquely styled merchandise for the body and the home reflect the passion and creativity of Argentine designers (our bulging suitcases proved it).